I’ve always been fascinated with computers, ever since my dad bought a 66 MHz PC back in the mid-1990s. They provide endless opportunities for customization, overclocking and programming amongst their usual functions. I’ve felt a shift over the past few years, however. Computers, for me, have moved more towards being items with a specific purpose and usage than a means of pleasure. Maybe I’m getting old, or the nature of the computer systems we interact with means that tinkering is no longer as useful. Our first PC made tweaking a necessity – achieving enough “base memory” to run the games I wanted to play ate up quite a bit of my time. As a child of eight, I found this tinkering enjoyable; I guess it appealed to my slightly introverted nature at the time. Eventually the DX2 began to show its age and our new PC (circa 1998) was a Windows 95 machine with a 333 MHz K6-2 CPU, 64 MB of RAM and a 6.4 GB hard disk. The games got more advanced, computers easier to use, and I got acquainted with the internet. The lack of the command line was a boon to my parents and made my life easier as well. 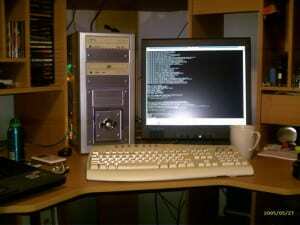 In December 2000, I did some research on the web and bought a PC based on a 650 MHz AMD Duron. The machine ran Windows ME at first (yeah …) and later ran Windows XP. It wasn’t long before I caught wind of overclocking and sought to squeeze extra 3DMarks out of my machine. I joined OC Forums and started reading; I spent many evenings and weekends on the forums and amassed a rather silly postcount. My computer played the games I wanted to play reasonably well, however the desire to tweak and get a few free FPS out of it took over. The computer didn’t overclock well – the best I managed was less than 720 MHz. The chipset was the VIA KT133, which wasn’t nearly as good as its successor, the KT133A. 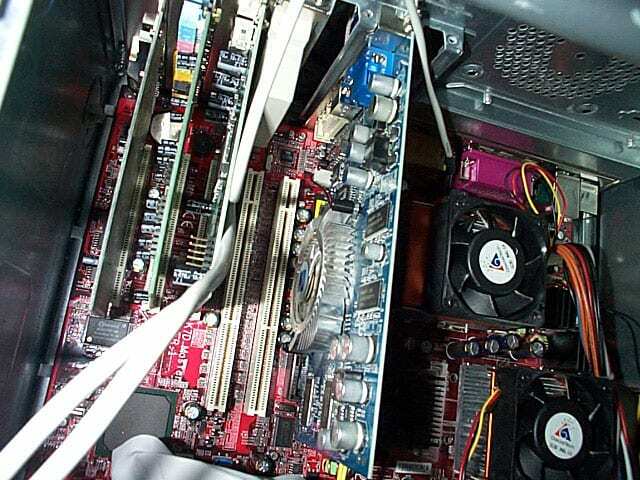 The board later ran a 1.1 GHz Athlon Thunderbird (best overclock: 1166MHz!). By late 2003 I was in my final year of high school and was working weekends. With this new source of cash (from an hourly wage of £3.26! ), I decided to go more exotic and built a dual XP1700+ (1.47 GHz) computer. A bit of bridge popping later (12 V battery and a couple of wires) and I had a pair of XP2100s (1.73 GHz). In hindsight, I should have tried for 2 GHz, but that’s one of the decisions I’ll just have to regret. The graphics card was decent for the time, and I overclocked simply because I could. 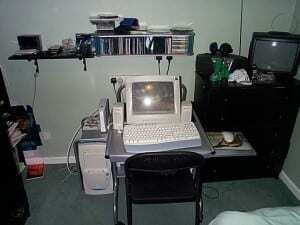 In 2004 I bought an Acer laptop (XP-M 2400+ with 256 MB RAM) which I used for internet and word processing. Then came a shift: the market for computers shifted towards laptops. I replaced my aging Acer with a new HP in 2006 (one of the first Core Duo machines) and soon after gave my duallie away. Laptops are by their nature less customizable, limited in upgradability and generally feel more serious. The final years of my degree hit me hard and I found myself tweaking, gaming and posting less and less. I relied heavily on the laptop for studying and writing. I started my PhD in October 2008 and now lean more heavily on computers as a tool; a machine broken by tweaking or overclocking is a nightmare. I’m a chemist by trade, but focus mainly on quantification and measurement and this means I need access to my data without fail; from Word, Excel and Endnote to Brüker Topspin, Berkeley Madonna, Kintek Explorer, SciFinder and MatLab. It’s all serious – nearly two years of my life as a researcher is on my portable hard drive. There’s little time for gaming, and little need to tweak. My laptop is beginning to struggle with applications but I plan to replace it shortly with a newer machine. It’s a tool, a means to an end, as much an item of equipment for my PhD as flasks and chemicals. I have an Athlon X2 7750 (2.7 GHz) machine at home. It’s nothing fancy – it has a few big hard disks and runs Linux. I store films, TV programs and music on it. It’s less serious, all play and no work. It runs at 3.12 GHz, just because I can. I question why it has to be one or the other. I'm a programmer by trade. I built my main desktop last year to mimic my work machine. My cpu is the same (albeit the Xeon version), it has the same amount of ram, and dual 22" widescreens. Since I just make office programs my video card doesn't have to be the same and I went with a mediocre ATI 3850 at the time. My rig has been great for both working at home AND for gaming. It handles WoW almost fully cranked up and when I pop open Visual Studio it does a great job there. Nice article. Brought me back to my Cyrix days and dreaming of the dual AMD system I never got to make. Oh, and the day I put together my 800 Duron system on release date. They are a hobby as well. Toy that has a purpose. I don't think it has to go one way or the other: I just feel that I've been moving from exclusively gaming/internet/music to spending most of my time on a computer working. I feel that there is a shift from systems that needed to be tweaked to be used at all, to systems where tweaking gave noticable improvement, to systems that really don't need tweaked. You can get a decent gaming machine without breaking the bank nowadays that doesn't need tweaked in order to run well. A couple of my friends are Ph.D students, and they in fact both are using overclocked Core i7's for their simulations. One of them asked me for help in overclocking his lab machine, and I pretty much said I wouldn't if I were him. He ended up at 3.5GHz on an i7 920 anyways, which is actually pretty modest, and enough so that it's not too risky. He says the increased performance cuts down his computation times by enough to be noticeable and the overclocking to be worth it. It doesn't quite address the "toy" or "tool" question, but it's some food for thought, and shows that tweaking can have its uses. Started out as hobby, then became career. No longer a hobby. I have two at home, one for the wife to play with and one as a HTPC. I could do without the one I use as a HTPC. After using all day at work (even surfing around to stave off boredom) I have no desire to mess with them at home. I think computers will always be multi-faceted, used for both business and pleasure. In fact, isn't that what computers were all about in the first place? Being flexible enough to do whatever a smart programmer could dream up and assemble instead of only doing a single task like older machines? With a computer background almost as long as mine I'm sure you'll agree it's the software/hardware comparison that makes the difference. Back then programmers could imagine and create things that were difficult for the hardware to accomplish in a short time. I remember altering and optimizing code so that there would be fewer program lines, which reduced load times and computing time - both of which were critical back then. Or how about using concat to store multiple flags to reduce program memory requirements instead of a single variable each? That's all ancient history with 4 Gb of RAM and 1 Tb drives common to most desktop machines and even laptops have more than enough for most applications. Today if a game falls 1 FPS because the code isn't optimized completely, who cares? The hardware is so far ahead of the software right now you don't need to tweak it. I mean, how many major programs use even two threads? No need to even talk about four, six, eight, or twelve threads. Back then programmers could imagine and create things that were difficult for the hardware to accomplish in a short time. I remember altering and optimizing code so that there would be fewer program lines, which reduced load times and computing time - both of which were critical back then. Or how about using concat to store multiple flags to reduce program memory requirements instead of a single variable each? Returns 0 if it's false (still 0 after multiplication), and 1 if true. Then on x go to is a multiple goto routine depending on x value. Works the same with gosub as well. This trick used to be nice back when saving a couple Kb's were a lot of deal. Today, I probably would have gotten lazy and not bother with compact routines. A lot of other programmers probably skipped this for modern computer to save time, contributing to bloating apps. I've a similar experience. Though I started tinkering with computers later than you I find that I very rarely use my computer for things other than work. I'm an electrical engineer finishing up my masters while working full time at a small industrial R&D company which designs motors/generators. Matlab, Flux 2D, Latex, and Outlook all get used regularly while all my games remain relatively dormant. Even my hardware doesn't get opened up, just every once in a while to top off the water level in my loop. Other than that my computer just churns away. It's a bit sad, but I suppose is a sign that we're aging, maturing.